Imagine this scenario. You find yourself in a painful place. Life feels like it’s falling apart; destructive things are going on in your life. You look at how you got to this place, and you realise that there are things you yourself are doing that are bringing pain into your life. You decide to do the courageous thing and deal with it – not just deal with the painful symptoms, but really deal with the issues that got you there in the first place. You get help, you do the work, and with investment, courage, hard work and time you truly grow and change. You get healing, you change your thinking, you shift your beliefs, and you grow. You come out of that painful place having dealt with not just the painful realities of the moment but with the patterns that got you there in the first place. You’re excited; you have hope. But you’re a courageous kind of person, so once again you begin the hard work of taking out this issue that seems to be your nemesis. Ever been in that position? I have, and it’s discouraging. At least, it was discouraging, until I embraced The Spiral Theory of Growth. 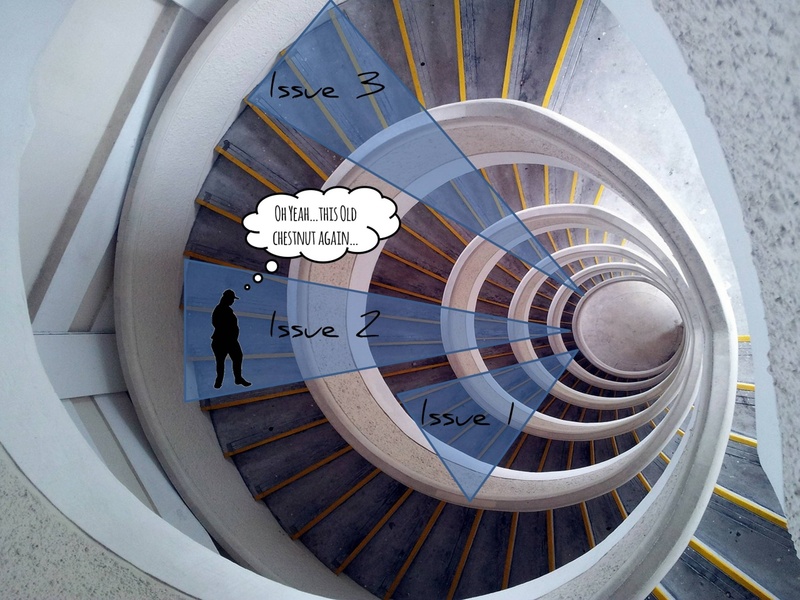 The Spiral Theory of Growth (I’m capitalising it for no good reason except to make it sound more official and legitimate) suggests that we don’t grow in a linear staircase to paradise/nirvana/perfection, but rather, we grow in a spiral staircase, meaning that although we may deal with a particular issue, we will circle back around to that issue again. 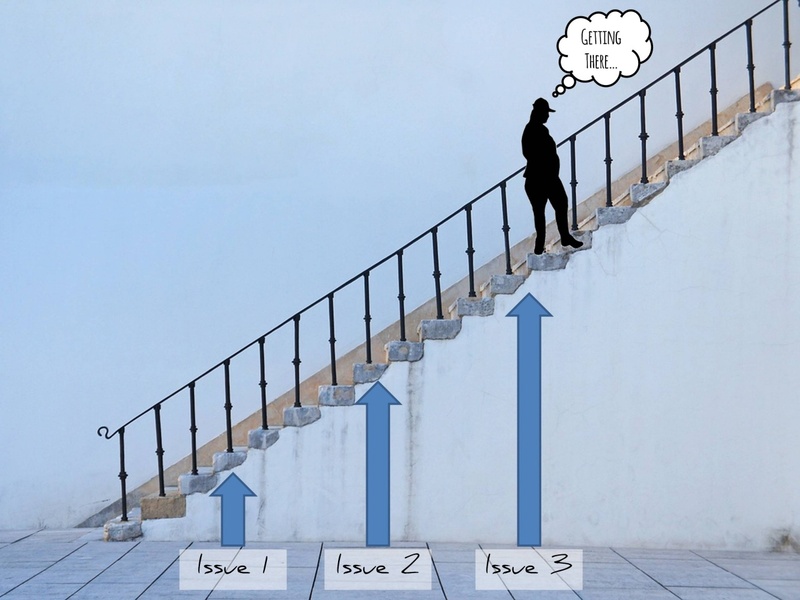 You just didn’t realise it was happening like that, because you were looking at your growth from a birds-eye view, and so your spiral staircase felt like a vicious circle. What does this look like in practice? Let’s say that the issue that took you to the painful place was finding it hard to say “no” to things. You walk into it on a lower-level stair. You say, “yes,” and “yes,” and “yes again”, and you’re taken out. You get overwhelmed, over-busy, tired, irritable, ill. Your work falls behind in quality and quantity. You stop enjoying the things you used to love. It’s a painful place. So you do the hard work to pull out of that place. You get your life back in balance, you get healing, and you learn to say “no.” You carry on with life, but sure enough, in time, you come round to that place of pain again. You’re tempted to say “yes” one time too many and you can feel things starting to spiral out of control again. You had thought you had this nailed, but you’re not discouraged, because you know all about the Spiral Theory of Growth. You’re not discouraged. Instead, you look around yourself and nod at your familiar surroundings. “I know how to deal with this” you tell yourself, and you begin once again the hard work of pulling out of that zone…but this time, your muscles are stronger and your healing goes deeper. It’s not that your healing wasn’t real last time; it’s not that your hard work hasn’t paid off – it’s that there is more to do, and when you’re ready, you’re taken back to that point to do that work – going deeper, getting stronger. Issues are not infinite. Eventually, you don’t come round to that place any more. 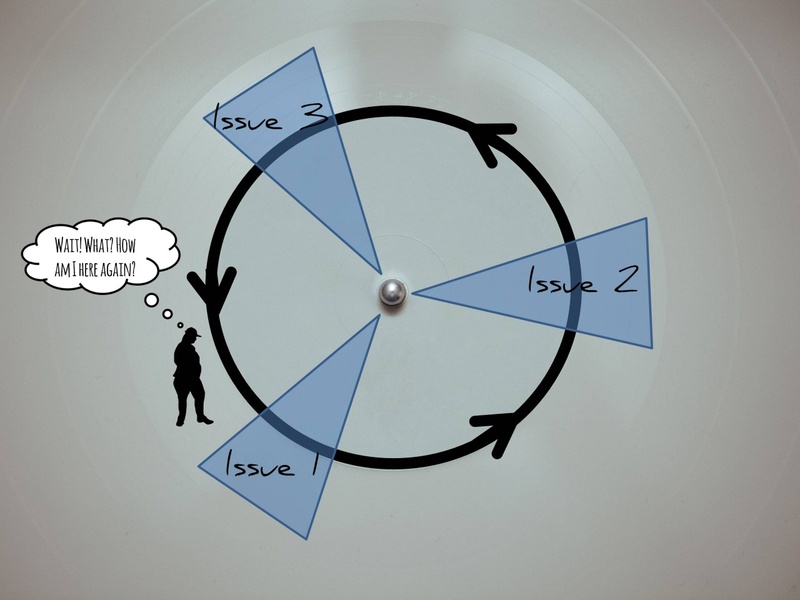 Eventually, as with Issue 1 in the picture above, you pass that point on the compass of your spiral staircase and you don’t go through the blue zone. Eventually, you really do nail it. Once that happens, you are an incredible resource to others facing the same issue on their own spiral staircase. In the meantime, remember this if you’re tempted to feel discouraged: you’re not going backwards. You’re not losing ground. You’re here because you are building on the work you’ve already done. You’re back at this issue again, but you’ve gone up a level; you’re closer to your destination. So keep doing the work; go deeper, get stronger. Because you’re that kind of courageous person.